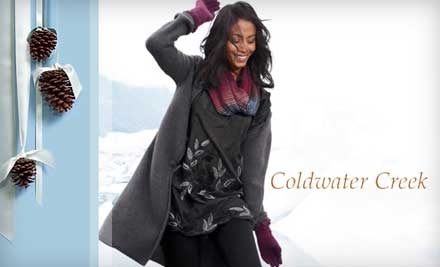 Today’s Groupon in Phoenix is a $50 voucher to Coldwater Creek for only $25. This voucher can be used online or at any nationwide Coldwater Creek location. My aunt finds some incredible deals during clearance days at Coldwater Creek, so I’m sure a savvy shopper could make this go a LONG way. The value of the purchase must be greater than or equal to the value of the Groupon and it must be used in one visit. This Groupon expires February 14, 2011. If you are new to Groupon, you can make your purchase here. If you are a returning customer, you can make your purchase here.